Have I told you all how great this year has started? I just have this really good feeling about it! Last year was a hell of a rollercoaster ride. I was way up and then I was way down, at times I felt like I had run out of luck and good fortune! Love seemed to have taken a permanent vacay, and at some point I was out of a job (albeit I quit my first job), struggling with my relationship… I was torn down, and even food was not sitting right with me at times! But that’s the thing about life, it hands you bad apples and just like that you receive a basket of peaches and what do you do? You make pie! So I got love back home, I got a job and I let go of that relationship that I struggled with, I mended my heart. In the midst of all that pie making, a man came along and returned my soul to me… I’m not saying much about that, but that is where I am right now; happily making pie with a renewed soul! I feel lucky. This post is NOT about pie, however. But a peach pie recipe should be in the works, to celebrate being lucky! So O’sinkirri, what the monkeys is it? It’s a new seafood restaurant located on Ring Road, off Lenana road. I’ll give you a little background, I heard of this place a few weeks ago from my friends Alma and Stacey (your first cameo on my blog YAY!). It is a venture from the same guys who run Cedars restaurant, where I hear have amazing food but yet to try it! So let’s make a date for Cedars… it can be one of my ‘Ladies of L lunches’… Did I mention that Stacey is one of the managers at O’sinkirri? It was the first day back at work in the new year, boy was that day long! I was in desperate need of good food and O’sinkirri was the restaurant of choice! We didn’t have much trouble finding the place, which is good because with my directions we most likely would have found ourselves in Machakos! The place is gorgeous, they have a beautiful water feature. They have a coffee shop, the main restaurant and a bar/lounge. The decor is lovely, the blue/green lighting makes you feel like you’re in the sea, which makes sense it being a seafood restaurant! We sat outside, in the gazebo. I ordered my wine, wine oh wine! after a long day, nothing goes down better than a glass of wine! The place is still very new so some of the items on the menu weren’t available, like I was dying to try the Kilifi oysters! 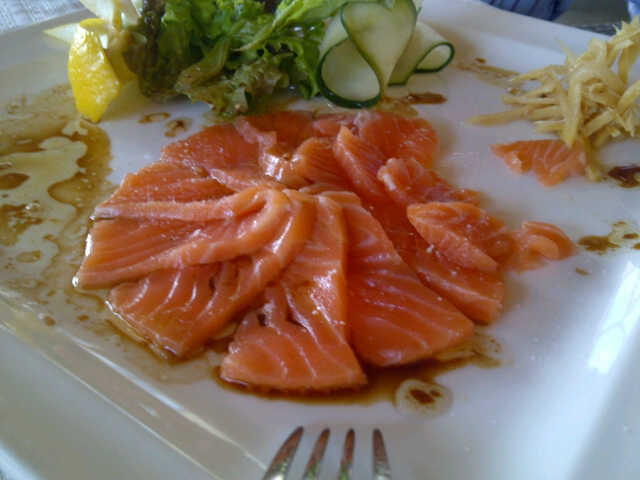 For starters we ordered salmon sashimi with soy and wasabi and a garden salad. Now if you know me, I LOVE my sushi! I think I mention sushi every day, and I am constantly pestering to be taken for sushi… The salmon was, divine! 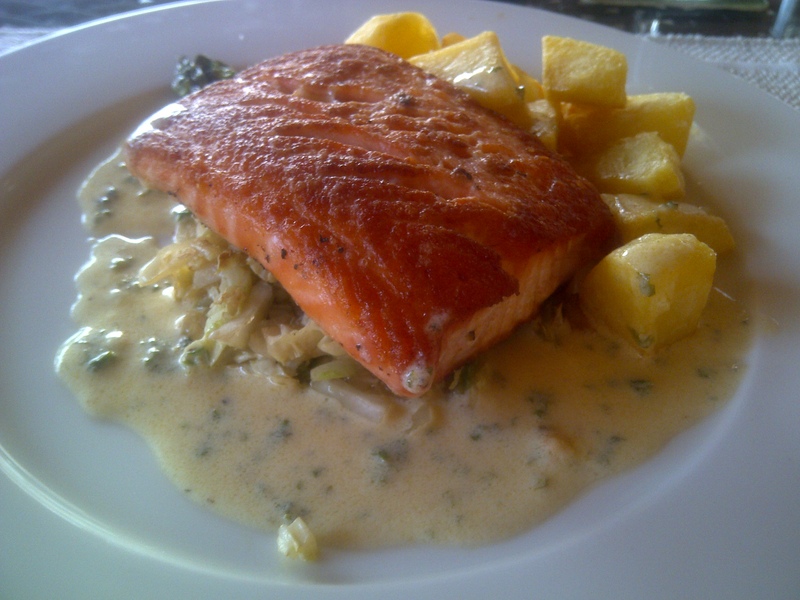 I had salmon for main course as well, this time Grilled salmon on a bed of cabbages and asparagus served with roast potatoes. Now for the life of me I can’t remember what the sauce was called, but it was really really good. The salmon was perfectly cooked too! My wonderful dinner date had prawn tempura served with vegetable rice and shell fish sauce. I’ve never seen tempura served on a skewer before, and I quite like the idea. It was definitely good tempura, and the sauce was not the kind you get out of a bottle which was so refreshing! We had a bit of debate on the vegetables in the rice, and the purple thing, turns out is turnip! Even I sometimes don’t know what some vegetables are, I ain’t proud but it is true! We stayed for about 4 hours, I guess good food and good conversation will do that to you! Thank you to my date Babu, as always it is a pleasure to share my meals with you… look forward to many many many more! Please visit O’sinkirri’s facebook page here. You write like a star…I love your pieces, how u combine it all with food and the life stories…very interesting, those two first paragraghs kinda reminded me of myself…and glad to find a kenyan who loves her sushi n good food! Love this page! 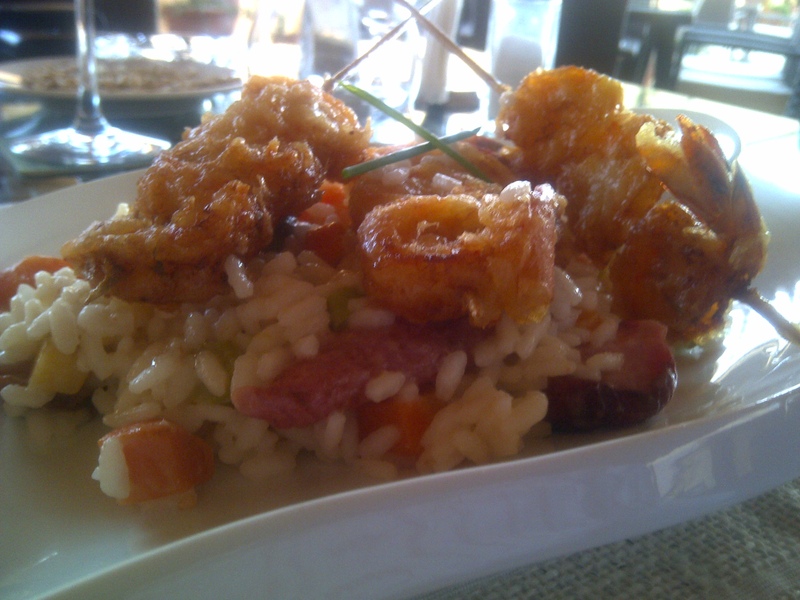 Thank you so so much for starting a blog on food…..I am so so proud to find a fellow foodie IN NAIROBI!! I am so trying O’Sinkirri this weekend. I love seafood and the pictures above have convinced me to make a booking for Sunday!! When you go to Cedars, you HAVE to try the grilled Chicken wings! I am serious…..I DRIVE across Nairobi for those things. And then do a mix of the garlic and chilli sauce and that combo compliments the wings perfectly….. *off to get me some chicken wings* I just got a craving!!! I’m loving that; Phenomenal woman! A fellow foodie… That just makes me very very happy!! we should have a big foodie meetup:) And thank you for your comments! I am humbled…. i love this blog,am ur #1 fun!! What a wonderful post! So proud to be a cameo on the blog! Hopefully ill be ur date when u try cedars for the first time! Luv luv luv deeperthanmykitchen!